We ended #NashataRun4CharitySouthAfrica on 31st March with 717km with 4 runners from South Africa and 2 Nashata runners. In April’17, Aida Saini, Rose Saini, Renee Ismail, Raudhah Abdul Rahim, Nahsuhah, Muzdalifah Anuar from Singapore & Malaysia pledge to run to raise funds for For The People & Community-FTPC for Ramadhan Grocery Pack Distribution in Singapore. Virtual run with the runners wherever you are for RM69 only. 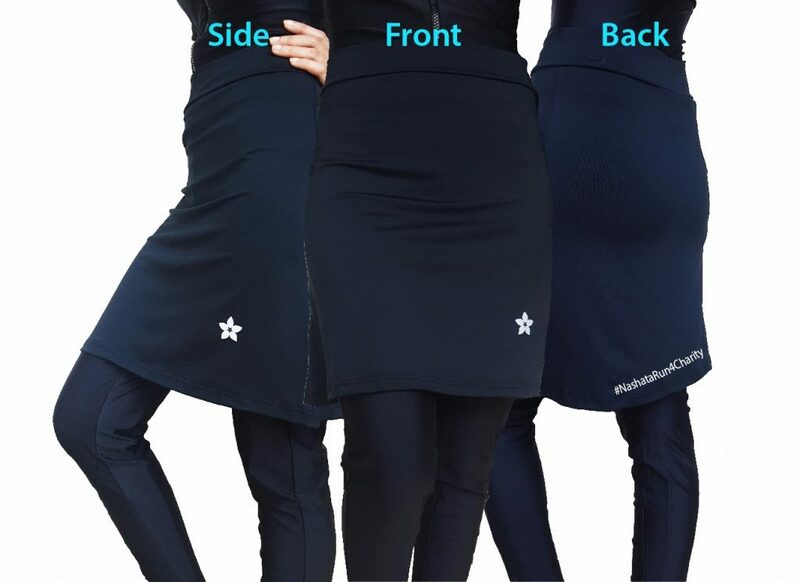 You get a Nashata EZ Finisher Skirt worth RM59 when you run more than 10km in the month of April. Shipping fees are not included for countries other than Malaysia. 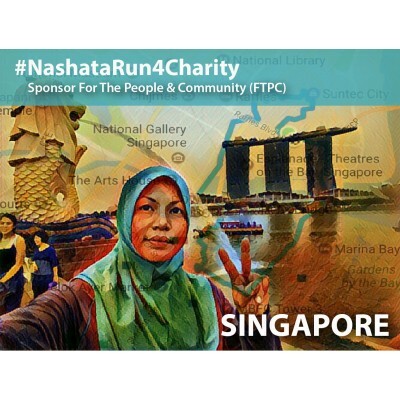 For proof of mileage for finisher skirt, post your final mileage on instagram and add #nashatarun4charitySingapore and your order number in caption. Sponsor the run for RM22 only. Add +quantity to contribute more! Started in Jan 26 2012 by a group of friends giving out cooked porridge to the needy. Since the years we have evolved into giving Grocery bags, Medi Kits amongst others. Their effort is #powerbythecommunity as all contributions comes from friends and families within the community of good hearted people. 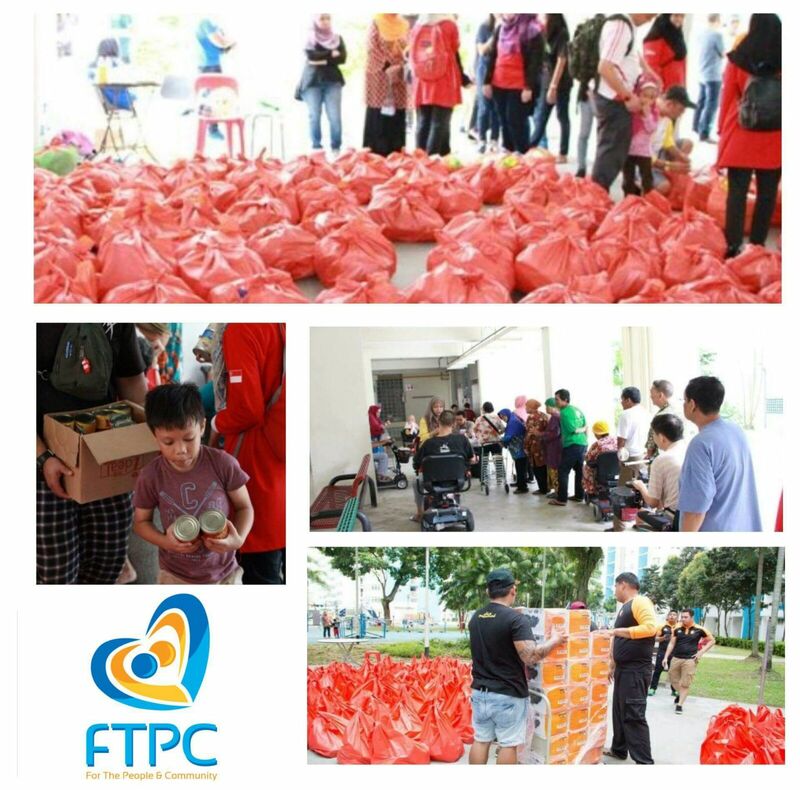 FTPC is previously known as ‘FEED THE POOR CAMPAIGN’. It is a virtual run that aims to raise funds for the ‘Charity of Choice’ in a new country every month. Nashata runners together with a group of runners in respective country would run virtually for the whole month. The runners get to choose the cause and beneficiary of the run. 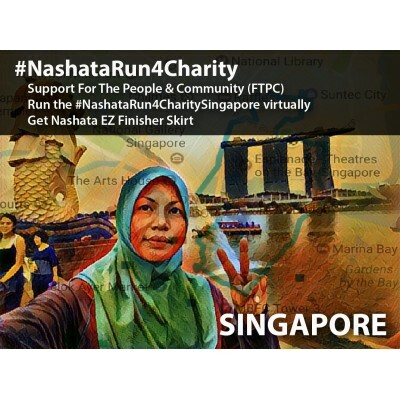 Nashata pays RM1 for every 1 KM each runner’s mileage. Assalaamualaikum… I am feeling exceptionally grateful today so I decided to write about my Inspirations. First and foremost, meet mummy dearest. Mdm Mahlia, 62, homemaker, mother of 3 beautiful girls (ahem.. me being the middle child thank you) 41, 37 and 32. As a young girl, i don’t remember Mak ever being involved in sports but she was always busy helping my auntie, baking cakes or at home sewing curtains, clothes and bedsheets and making hand-crafted flowers to decorate our home. Our home is always beautiful and bright. Although not sporty, Mak is very sporting! She loves thrill rides like the Triple Looper @ Genting and banana boat rides (unlike Abah who will graciously decline to participate and volunteer to “jaga” our belongings instead). I know who i inherited my fearlessness from! As the years passed, Mak put on quite a lot of weight (which she blames me for). When she was diagnosed with Diabetes and Hypertension a few years back, she took it upon herself to opt for a lifestyle change. She did not complain nor lament at her plight. She religiously followed the doctor’s advise, took care of her food intake, put in effort to reduce her weight and started to exercise. She did not really plan a workout schedule but incorporated them in her daily routine. She would sometimes cycle to my sister’s place (10km to and fro) or stop by the Fitness Corner at her neighbourhood for a 20-30mins workout before heading home to continue her duties. Mak overcame her fear of swimming and joined me for class! Today, Mak is actively involved in fitness activities organised by the mosques and community centres. She continues her daily routine and has loss nearly 15kg since she started. Her blood pressure and blood sugar level has also improved tremendously. When she got injured and tore a tendon in her right foot, she did not let that injury deter her one bit. We were slightly worried about her safety but I am amazed by her tenacity and determination to recover and get back in shape. I see that in her, all my life. That stubborness and never give up attitude. And it is that strength that got me through adversities and life’s worst moments especially during my time in the armed forces. Mak… you are always my inspiration! 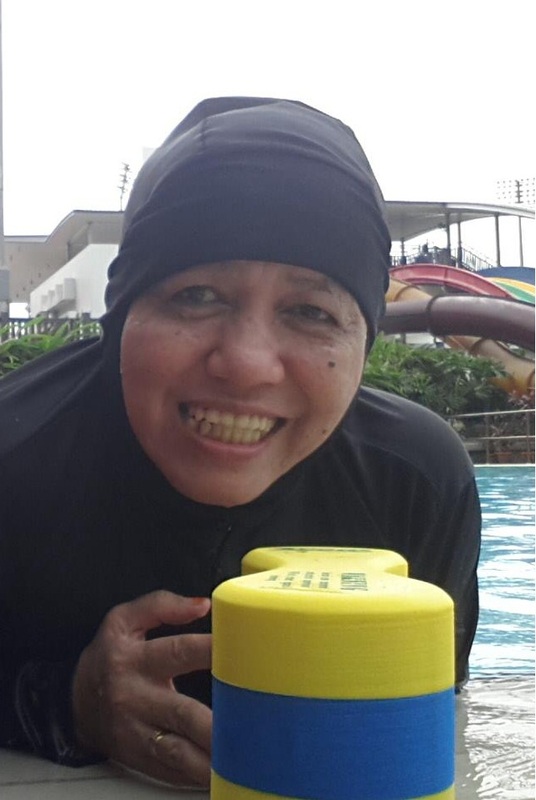 Meet Mdm Hayati, 52, homemaker, mother of 3 (23, 22 and 16). I love her bubbly-ness! There was never a dull moment when she is around. Kak B, as we lovingly call her, did not like any sports before. She hates getting sweaty she said but when she sustained a slipped disc and was immobilized for a month, she knew she had to do something. “I do not want to die like this”. Upon recovery, Kak B tried slow jogging but found it too strenuous for her due to her health condition. So she tried swimming as recommended by a friend. But she did not know how to swim. I met Kak B at the pool during one of my lessons in 2015. She approached us and requested to join our class. Allah definitely is the Best Planner! I think I learnt more from her than she did, ma shaa Allah. It’s always interesting and beneficial to hear these veterans talk about life and sharing their motherhood experiences. Makes one feel so humble yet excited for what more lies ahead. Today, Kak B swims 30 laps every week. She continues to amaze me with her constant cheerfulness and is always keen to learn more. She diligently listens to my instructions and continues to improve her strokes weekly. She can tread water for more than 5mins without breaking a sweat! I’m dying after just 2mins! Sometimes we had to pull her out of the water because while the rest is pancit after 20 laps, she is still smiling through 30… AMAZING! Last but certainly not the least, meet my Iron ladies! They say “Friends who work out together, stays together”. And they prove it right. These ladies not only work out together but they eat together, attend religious classes and bakes together. 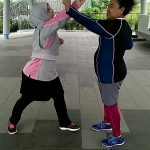 Kak Has and Kak Normah were both part of their school’s athletic club (donkey years ago) but sheepishly admitted that they stopped being active after marriage and having children. By 40, both commented that they became overweight and started to feel the strains due to the weight and inactivity. It was Kak Has who took up the challenge and participated in a “Lose to Win” programme organised by the Health Promotion Board (Singapore). She definitely loss weight but she also rediscovered the zeal of an active life again. Since then, Kak Has remains active with weekly programmes and participating in races. She completed Swissotel Vertical Marathon tau! 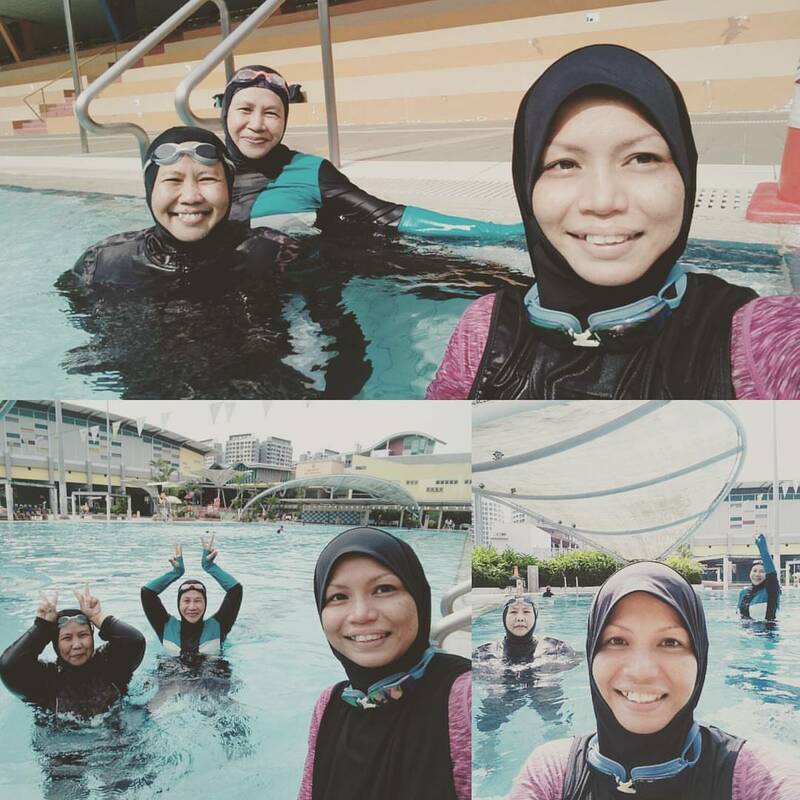 Something I myself malas nak attempt hehehe… She then encouraged Kak Normah and Kak Mus to join her weekly activities. Kak Mus who has always been active ( you can tell by her sturdy posture and strong look) represented her school in hockey, badminton and softball. She continued being active doing brisk walking during her stint as a bus driver. She says she needs to do this because she wants to be able to keep up with her 11 -year-old daughter. Now these iron ladies swims every Tuesdays/ Fridays. They also have Aquarobics on Thursdays and group training on Sundays. POWER kan! Of course, while being active, they never neglect their duties. They attend religious class on every other day and they are wonderful cooks and terrific mums+wives. They are always up and about attending new classes and searching for new makan places. Who dare says that we women cannot do everything?? All 3 agrees that being active makes them feel more energetic unlike their comrades who leads a more sedentary lifestyle. They say they are able to perform their ibadah and daily routines much better with a healthy body and mind. These 5 gems have definitely created a great impact in my life. Not only am I inspired to continue this fitness journey till I’m wrinkled and old, I learnt so much from them in other aspects of life as well, as a mothers, daughter, wife and friend. May Allah bless them with strength and perseverance to continues this journey. Do you need to be flexible to yoga? Do you need to be superfit or super lean to perform headstand and all those difficult-looking poses? The answer to all is NO. 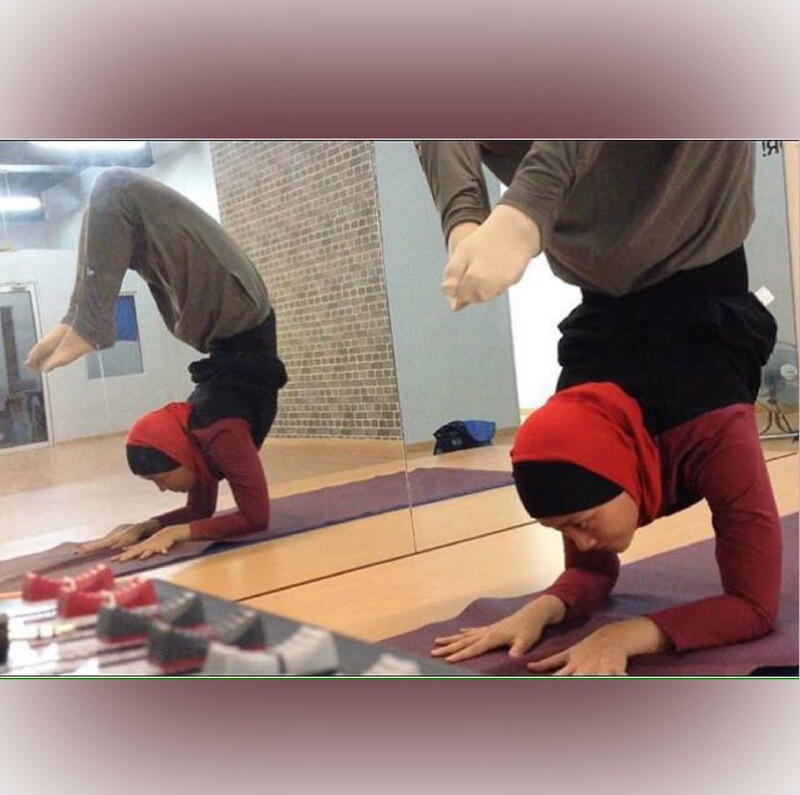 We are featuring yoginis in hijab across the globe and their lovely journey in yoga. With a common love in yoga, these 10 inspiring ladies from different ages and backgrounds share why they embark into yoga, where they get their training from, their routines and their personal views on how yoga has benefited them. For newbies and those who wanted to try yoga, you can learn from these strong and beautiful ladies. Just follow their instagram and nashatadotcom’s instagram for tips and updates. 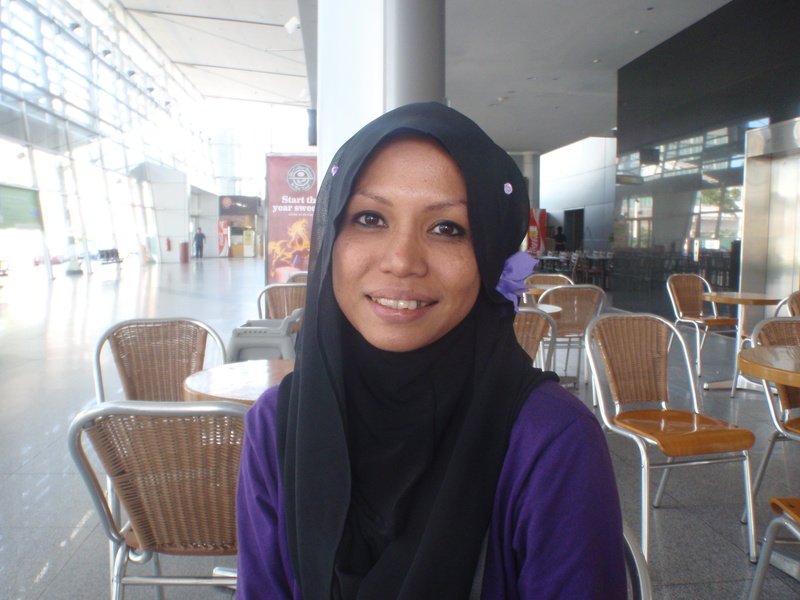 Amani is a full time Biology teacher and part time yoga instructor in Brunei. She started yoga back in 2006 during her university days, where she set up a yoga club. Yoga is her way to release stress and she finds yoga to be different than other sports. To her yoga eliminates all sense of competitiveness and comparing with others, while she focuses on herself, my own practice. After completing 200 hour yoga training at Ubud Bali in December 2014, Amani teaches yoga. She is also a prenatal yoga teacher. 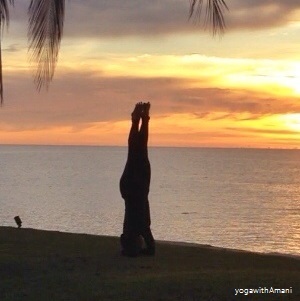 Despite her busy schedule as a teacher, Amani teaches yoga three times a week at the studio. Other than teaching, she enjoys performing the yin style yoga and sometimes vinyasa or stronger yoga routines. Now, she joins her favourite international teachers online as ways to improve her routine. ~ Yoga makes Lola happy and strong, and most of all to her, it is a never ending journey. A self taught yogini initially, Lola started yoga when she had lower back pain in 2014. She joined yoga classes a year later and found improvements in her practice since, especially alignments. Lola works as a freelance subtitler, and she balances her time by attending classes twice a week at least, except weekends. She enjoys hatha, iyengar, power yoga, sometimes swing yoga and ashtanga. She practices backbends and handstands frequently at home. 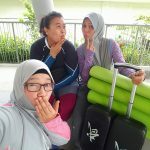 A mother residing in Jakarta started yoga 3 and a half years ago when her sister took her to join a private yoga class. Since then, Erzi and friends have private yoga classes at sister’s house. Yoga is a not a high impact activity and is an enjoyable journey. Despite gentle movement on a mat, yoga can make one sweat and build one’s energy, explains Erzi. To Erzi, yoga teaches her to breathe well and stay calm and relaxed in any conditions. Even though she has been learning yoga for more than 3 years, she still attends yoga classes at a studio and private yoga class once a week with her sister. She starts her practice with meditation, minus chanting. To her, meditation connects her breathing with mind and that helps her improve her routines. She would then stretch her neck, arms, sides of my body, spine and continue to Sun Salutation A for 8-10 rounds before continuing to my peak pose of the day. She advises other sisters to learn yoga online like Youtube, if there is no studio closeby. She shares that some of the well-known yoga teachers online has some beginner tips about how to get onto your mat while others have classes for beginners to intermediate level. She also finds instagram as a good channel to learn yoga. 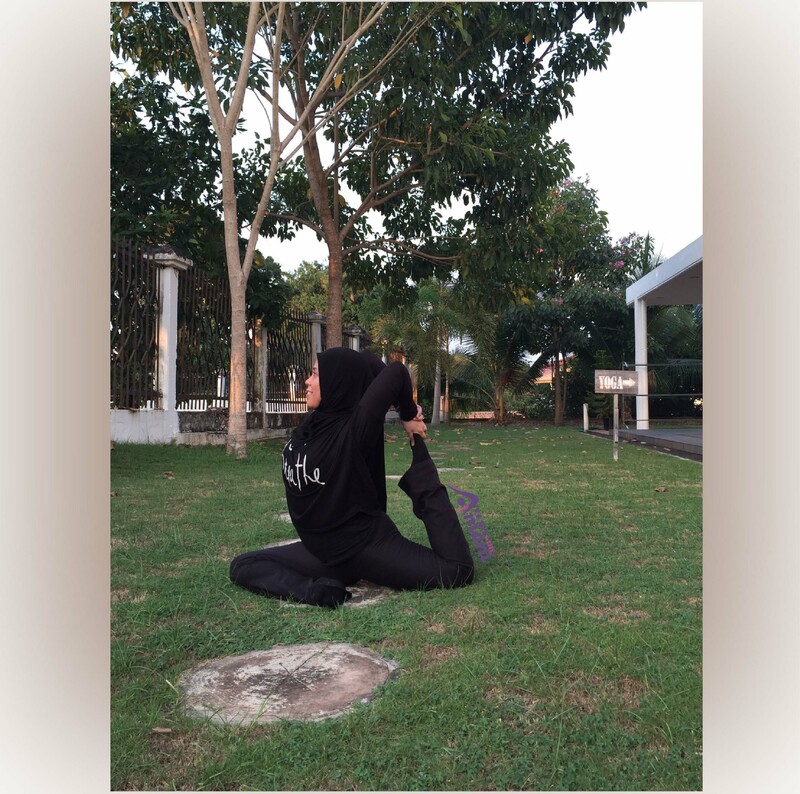 Najwa started yoga 17 years ago at a tender age of 14. She started yoga to improve asthmatic condition. 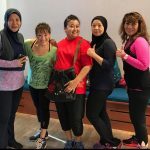 Now, a Fitness & Yoga Instructor, Najwa finds yoga important to keep her improve body strength, maintain a lean body and to keep healthy & flexible. Most of all, the breathing techniques help cure her asthmatic problem. 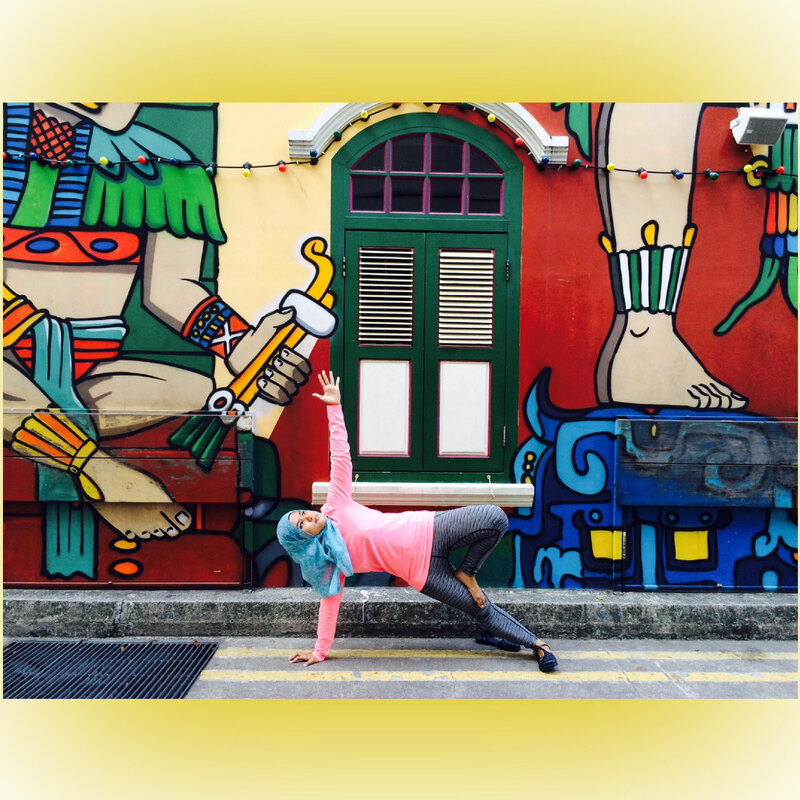 Being a qualified Hatha Yoga Tutor from Slimhealth Aerobic & Dance Studio and a fitness instructor, Najwa’s routine is colorful. She urges beginners to learn from a qualified and professional instructor to reap the benefits of yoga so that you can get a lean, curvy and fit body. 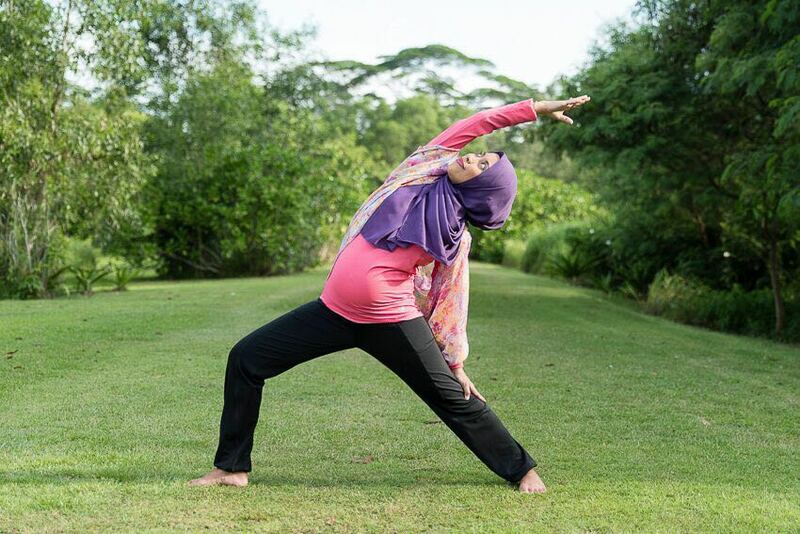 An engineer by profession, and certified yoga instructor, Nadiah started yoga to loose pregnancy weight. Yoga fits the need as she wanted something she could practice at home. She also finds yoga as a good weight training exercise as you’d need to do planks, lunges, inversion, and arm balances which are important for women to increase stamina and metabolism. To Nadia, yoga is not about the asanas (poses), but the journey into achieving them and to remain calm through proper breathing in maintaining poses. Keeping calm is important in her hectic daily life. Till today, she is fascinated by what her body can do and it serves as a reminder for her to care for her body – a gift from Allah. Like Erzi and Amani, Nadiah also uses technology to learn yoga at beginning stage. After which, she attended Atilia freeyogafit class at KLCC. She took teacher training at MAYI to be a certified yoga instructor and now she practices Ashtanga at Mysoreroom KL in Binjai 8. She trains every other day for 10 minutes and suggests newbies to practice safe and find a good teacher to help with alignment and postures. ~ Yoga is not a destination…it is a journey that enriches you every step of the way. A mother of 4, a lactation consultant and an serial entrepreneur, Rita started yoga in 2011 when she was living abroad as an expat wife. At that time she had just lost her baby, and despite having support from husband and children she felt rather lost and depressed. She read a lot about yoga and was intrigued by it further after hearing friends talk about it. Soon, she hired a personal yoga instructor who came 5 days a week. Rita emphasizes the importance of breathing techniques; the techniques that help achieve relaxation, mental clarity and eliminates stress , fatigues, depression and anxiety. She felt better and healthier after a few sessions and after 3 months into yoga, she was pregnant again and she continued to do yoga throughout her pregnancy. Her 4th baby is a peaceful, happy, yoga baby. He’s always wanting to practice yoga with Rita whenever he sees the mat! Despite her busy schedule running her businesses Bebe Sachi and The KembaRA, Rita yoga at least once a day either in the morning or everning. 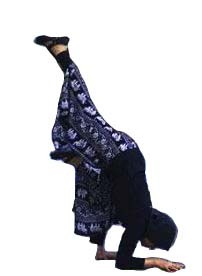 She likes inversion poses because of its many health benefits. Among others it helps supply blood to brain, build your core strength and balance to our body. Nura started learning yoga at a young age of 17. She wanted to improve athletic performance and saw progressive results in stamina running long distance despite having asthma. She survived colon cancer and irritable bowel syndrome in 2012. Currently 6 months pregnant with her first baby, Nura finds pranayama (breathing techniques) and a quiet 15 minutes mindfulness shapes her to be better version of herself, discovering weakness and grounding herself from pride. She dedicates 3-4 times weekly of prenatal, hatha and restorative yoga while committing herself to do house chores. 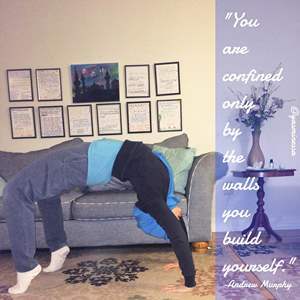 A committed fitness entrepreneur at @fitness4muslimah and a certified yoga trainer (Ashtanga & Hatha), Kids Yoga teacher and Prenatal and Postnatal Yoga teacher, she advises other sisters to just show up on the mat, no matter how you feel that day. Nura loves all yoga poses and always balance her flows with standing poses for concentration and balance, twists poses for internal detoxification and help keep irritable bowel syndrome at bay, hip openers, backbends aka heart openers which helps her a lot in strengthening interpersonal relationship with students and loved ones. 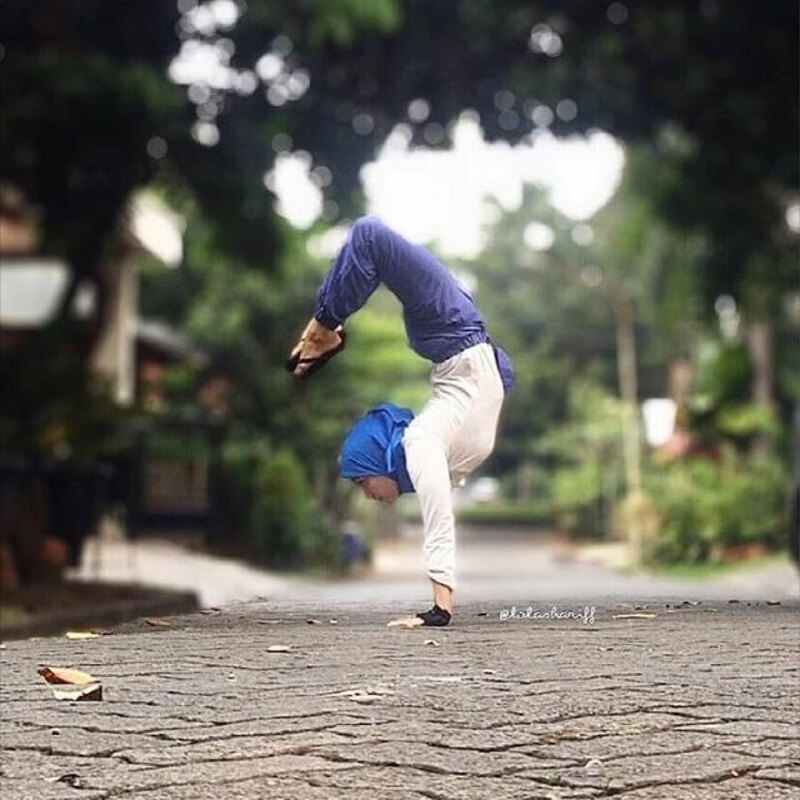 She loves arm balances such as crow, eight angle and headstands for core and grow her upper body strength after spending almost half of her years building endurance in lower torso for athletic performance in school. ~ Yoga is non-competitive, so there is no need to feel pressured or exert yourself in a pose. From running to yoga, Farah, now a yoga teacher, started attending yoga classes 9 years ago and only looked into yoga seriously in 2013. Yoga became a regular practice when her scoliosis started to cause numbness on left leg.She received training from Tirisula Yoga in Singapore. 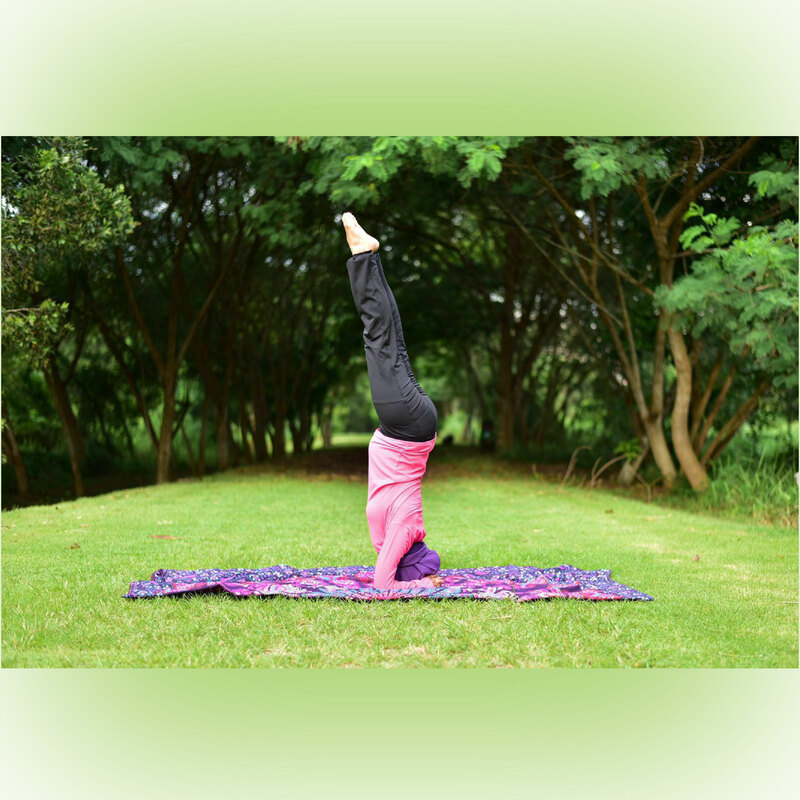 Farah starts her morning training with some pranayama (yoga breathing exercises), followed by a few rounds Sun Salutations and simple stretches like forward folds, backbends, twists and a headstand. She tries to do Ashtanga practice at least once a week. To Farah, everyone has a unique body type and it’s important to work within own physical limits. Farah echos other yoginis reminders that with regular practice & patience, our body will get used to the routines. Yoga is a journey of self-discovery. ~ You won’t understand the gain that is waiting for you until you try it and judge from experience. Nura Arabi, like other sisters in fitness found love in yoga. Nura is a physical education and health teacher and she teaches swimming and Zumba and she writes about fitness. She started yoga in 2015 and practices twice a week since. She started learning yoga at a Yoga center, after which she learn via youtube videos at time of convenience. To Nura, yoga is a good way to get deep into herself as it teaches patience, body awareness and improves muscular and mental strength. Yasmin started yoga when she was a senior in high school and has been into fitness since. She was the first female student trainer at Montclair State University, but it was after college her love for yoga grew. Yoga helps reduce pain she has on her back due to idiopathic scoliosis. Yasmin enjoys flowing from downward dog to plank to upward dog to child’s pose as it warms her body up for a more rigorous workout, or to stretch out. She reminds newbies not to compare yourself with others and to focus on being most present in your own body, mind, and soul. Chelsea started yoga in May, 2015 when she was traveling a lot and didn’t have access to a gym. She fell in love with it so much that decided to start a full-time practice. Chelsea finds there is always something to work towards whether it is more advanced poses, building strength/flexibility, or working on form and technique. A self taught and self-motivated person, Chelsea constantly progress and keeps pushing herself to get better and better in yoga. She practices the Ashtanga yoga method, memorizes a sequence of poses and practices every day. Once she feels she has mastered a certain set of poses, she would move on add more into her routine until she eventually memorizes the entire Ashtanga sequence – around 40 poses. 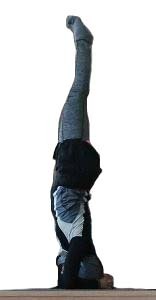 Like many of the other yoginis, Chelsea really love inversions and arm-balances because of the core and shoulder work she gets. Her favorites would have to be the forearm stand, handstand and backbend. She reminds other sisters not to be afraid about not being flexible enough or skinny enough and they are not important. Yoga is for absolutely everyone and it is a progression. Chelsea does many other types of workouts and finds yoga great workout. She actually needs to keep a sweat rag next to her mat during practice! What are you waiting for girls? Just get onto the mat and go through the beautiful journey of yoga. You can get a lot of help from these inspiring yogonis! The WOW Run is back, but NOW, with a refreshing concept! It was brought to life by Efah Irishanur Anuar on 9th February 2014 in Singapore, bringing together more than 1,000 ladies from all walks of life. The objective was simple – to encourage fellow women to participant in Sports and Fitness and engage in an active lifestyle. It is aligned with Nashata’s philosophy, which is to empower active lifestyle through modest sportswear. This year, Efah and team are taking the WOW Run to a greater height through the http://worldwowrun.com/. It is going to be held on the 25th October 2015 (Sunday), 7 am, in many many countries. As surreal as it sounds, it is an amazing effort to gather ladies across the globe to celebrate fitness and health together. 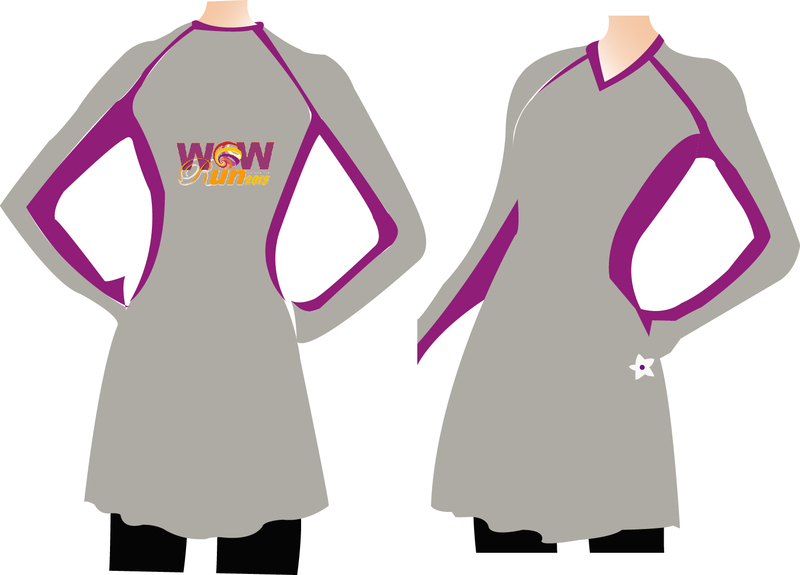 Our undivided support for the WOW Run continues this year, by organising and co-sponsoring the 5 km Run in Malaysia. We are holding the run for ladies above 12 years old who resides in Malaysia. 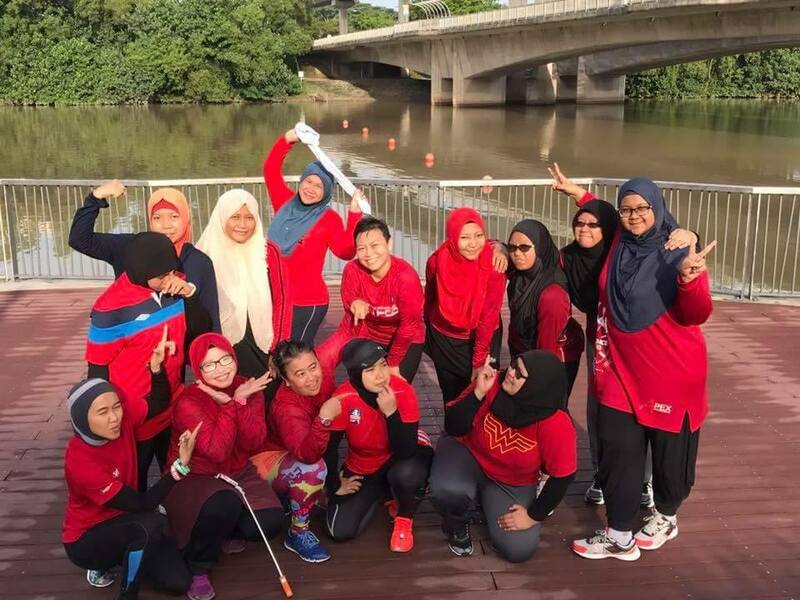 It is a day for ladies to come together and have an exciting run at the heart of Cyberjaya, Selangor. 1. Who can participate in the WOW Run 2015 Malaysia? Female from age 12 and above, residing in Malaysia. 2. How much is the registration fees? 3. 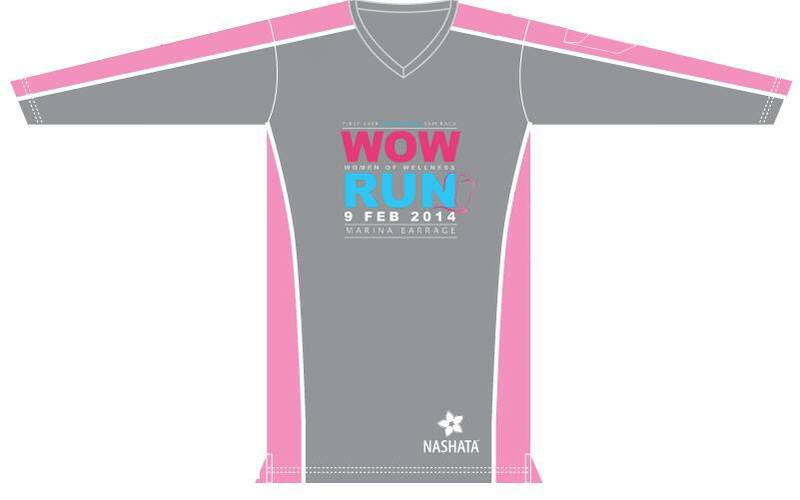 What do you get at the WOW Run 2015 Malaysia? Why join the WOW RUN 2015 Malaysia? You get many goodies that you can really use. You get a usable running tee that you can happily wear without wearing additional shirt inside. We will ship your racekit to you. Yes, you need not to worry about going through traffic in between work hours to pick up your racekit or trouble your friend to pick up on your behalf. We welcome volunteers and sponsors, so if you are keen, let’s talk. Just email contactus@nashata.com. * indicates more information to be provided soon. Which “her” are you in Summer colors? What color would you like to put on, in the coming summer? Which “her” are you? 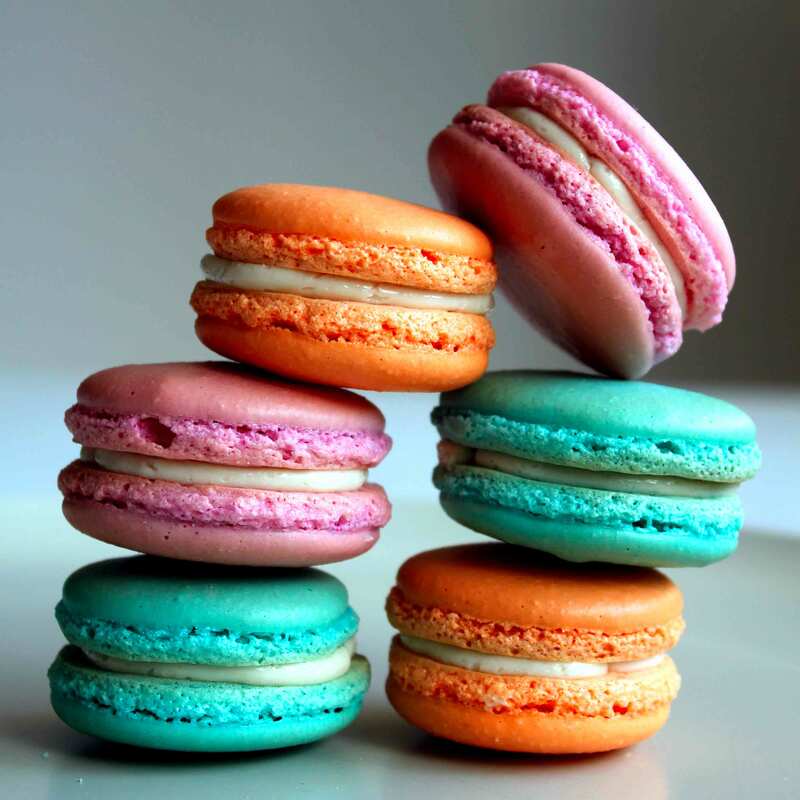 She’s going to run into the sky; she wants to have a blueberry cake; she has got a lot of love… Her mind is clear like the water and her attitude is simple but strong. When she feels hot, she would just drink a glass of ice drink and throw herself into the swimming pool. Is she wild? No, she is just cool. Where is the icon? She is here. We can feel the power is nearby when she is coming. Always energetic, always smiling, always gives an outstanding impression. That’s her, the friendly orange queen. Do you enjoy your time of having deep thoughts? Still confused? She definitely does. Because she is an independent lady. Her mind is well developed, her thinking is sensible and her behavior is natural and generous. She was born in the modern and always looking into the future. Her wisdom makes her more and more beautiful. She is like a light. She brings happiness to people. The life is hard for everyone, we should try our best to fill energy for ourselves. However, she is like an apple, you can’t smell it by distances, you would just love the feeling when you bite it. Sweet, healthy and fresh, unable to forget. Ms Mystery is in front of the flowers, she looks noble, smart and attractive. When the wind comes, she closes her eyes and takes a deep breath. Maybe it’s difficult for people to understand her by the first sight, but she is real. She uses her sincere heart to do everything and share everything kindly. No doubt that her gentle experiences let her go further and further. The World’s First Muslimah Run will take place on the 9th February, 2014(Sunday) at Marina Barrage, Singapore. 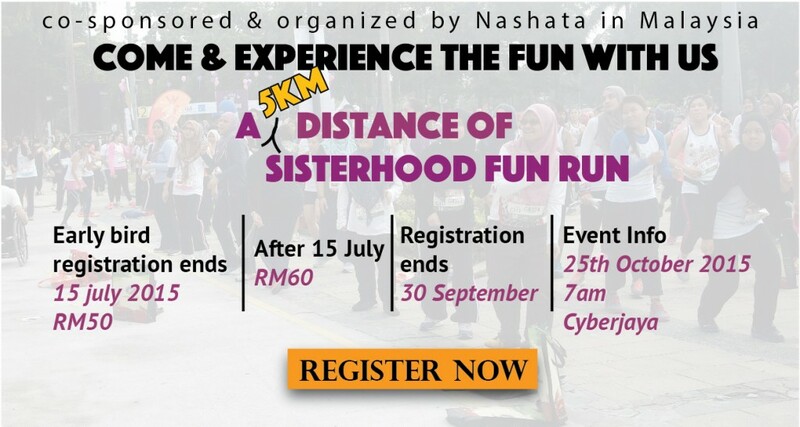 The 5km run will be participated by more than 600 muslimah, InsyaAllah. We were privileged to speak to the lady behind the inaugural run, Capt. (Ret) Muzdalifah Anuar. She was busy getting POPWOW Team booth ready for the Race Pack Collection at Singapore Expo Hall 6B, but gracefully kind to share with us about the World’s First Muslimah Run that she planned for since 2012. Capt is the founder and coach at Women of Wellness, also known as POPWOW. 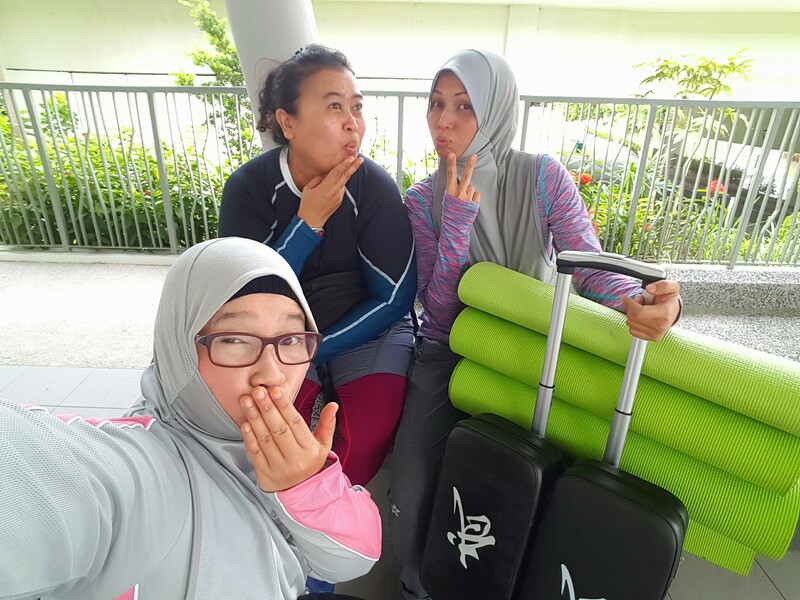 At POPWOW, Capt coaches other sisters the importance of fitness in Islam. Capt. started POPWOW in early 2013, after serving the military as an army officer for 13 years. A mother of three, her decision to start of POPWOW came about not long after she started wearing hijab. In Singapore, where 15% of the population is muslim, hijab is not allowed in uniform-based profession like the army and nurse. The debate and petition about hijab at public-sector, uniform-based profession has been discussed a lot since November 2013. Whether or not hijab is problematic for some jobs, as for uniform based profession like nurse and army, in other countries like Malaysia, hijab has proven not to cause problem at work. There are many efforts to educate others about diversity and the beauty of the hijab, including the World Hijab Day. In Singapore, the World Hijab Day turned out to be controversial when the local ambassador and supporters receive resistance from the government and threats. Like many other muslim women who chose to wear hijab for the love of Allah, it was an easy decision for Capt to choose between hijab and career. With her vast knowledge in fitness and wellness from her military days, helping other women to be FIT was the choice she made. To her, success is not just this life but also our after life. FITdunya & FITakhira… as how she says it. Let’s understand more about the run as shared with us. 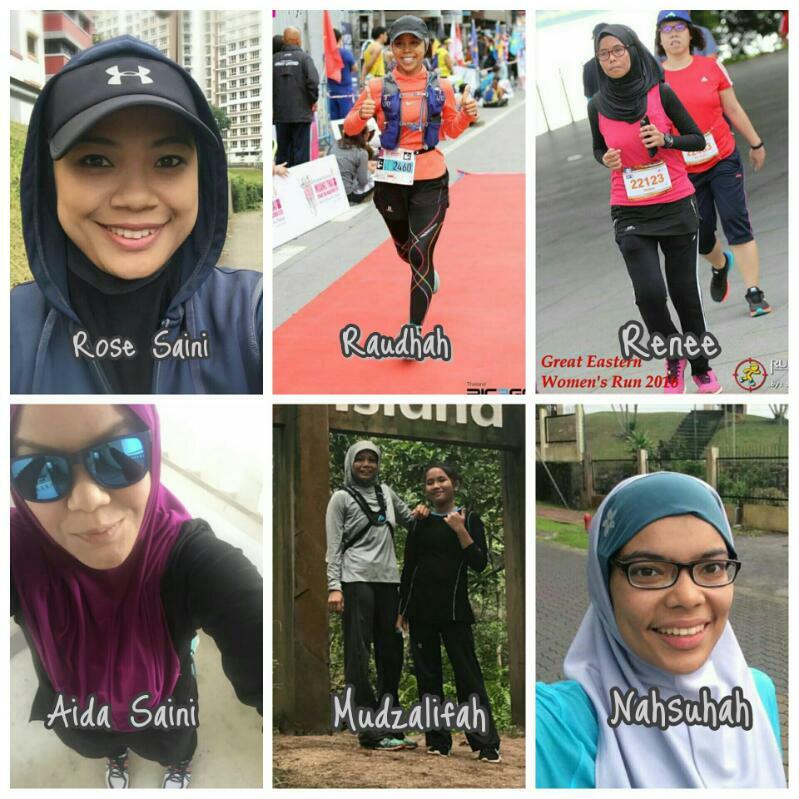 What motivated Capt to organise the first Muslimah run? Capt runs full and half marathon. Prior to this, there were not many muslimah running marathons in her country. She wanted to have more muslimah friends to run with her. 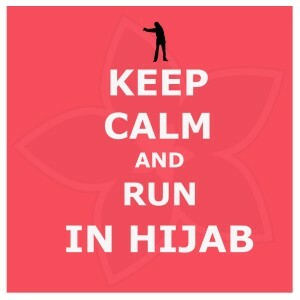 So, through running, she wanted to promote fitness in Islam to the other sisters and have more friends to run with. When did the idea come about? 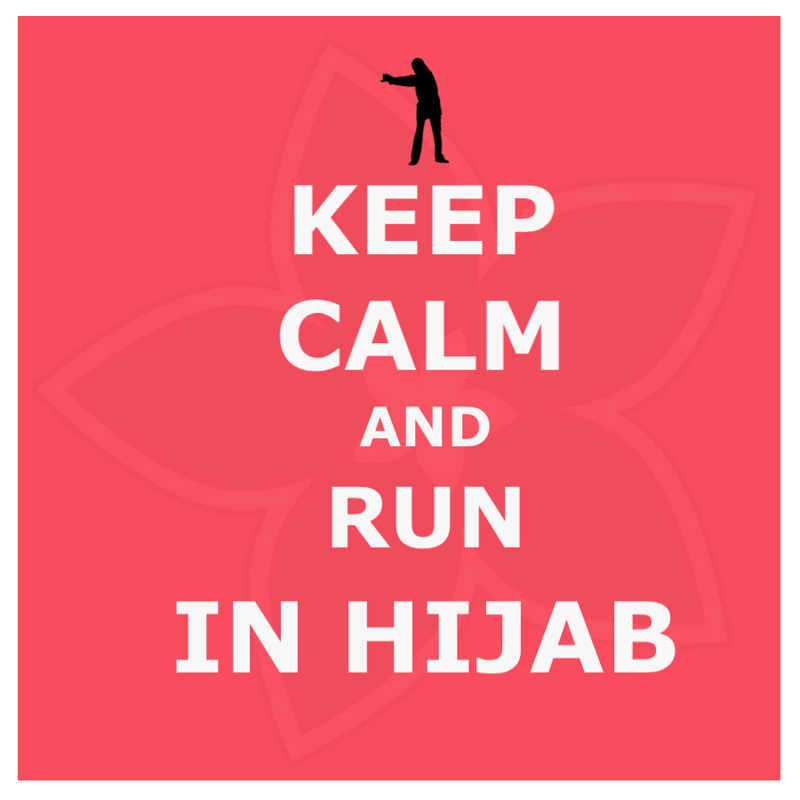 The idea about having the first muslimah run came about late 2012. Since then, she started talking to religious, governmental and political parties to get support and endorsement. After much discussion and plans, none falls through. So, in early December 2013 after initial supporters backed out, Capt was determined to organise the run on her own, as scheduled – 9 Feb 2014.
Who is the organiser for the event? 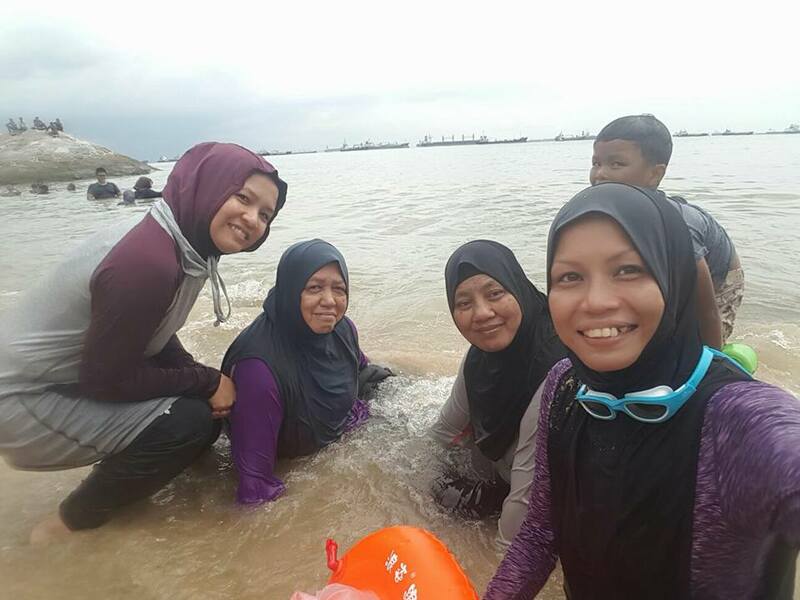 Capt was able to get support from other private entities that have common goals for muslim women – Fitness in Islam. The parties are Grundy and Yameen. 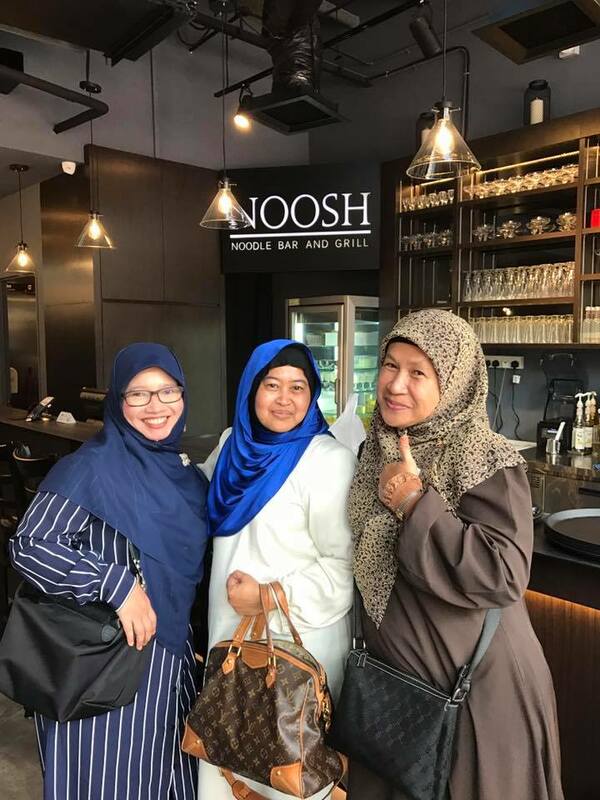 Together, within two months, they organise and promote the run through various channels, that includes awareness at the madrasah, online channels and many other events. To Capt, her family and friends have played a pivotal role supporting her in making the run happen. Who are the sponsors for WOWRUN? Alhamdullillah, the run gets good support from private sectors. Ummah is the Official Sports apparel retailer for the run, sponsoring the prizes for top 3 winners for all categories. Apart from that, Nashata is humbled to be the partial t-shirt sponsor for the run. The biggest sponsor for the run is Aquila-style. It is a digital media on muslim fashion and pop culture. How many people is Capt. targeting for the run? Capt’s initial target was 800, but reduced to 500 when she had to organise the run on her own. Alhamdulillah, the tickets were sold out very fast within a month and captured 600 registration, beyond her target. What is Capt’s aspiration for WOWRUN? 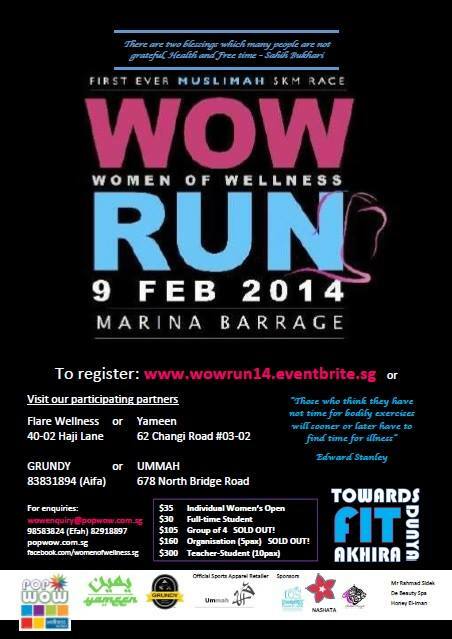 She wants to make WOWRUN an annual event in Singapore. She is also looking at running the same in Malaysia and Indonesia in 2014. Apart from that, she wants to make more avenues for muslim women to hold fitness activities together. She plans to do monthly clinic. Currently, she runs pilate and swimming coaching sessions at POPWOW. What is next for POPWOW? Capt plans to open up a Muslimah gymnasium in Singapore soon. InsyaAllah, with her strong will and determination, it will come through. Don’t you think? 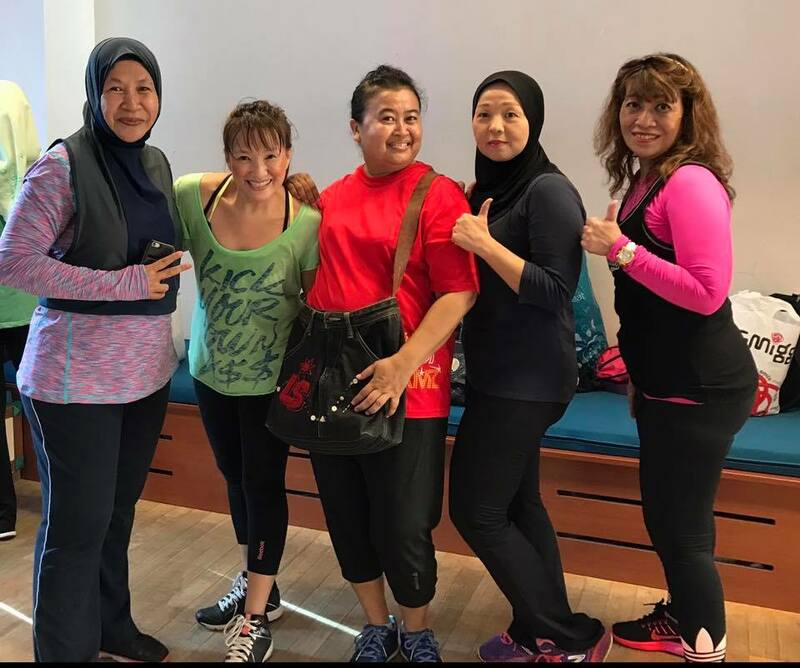 With the other muslimah run in other countries and muslimah gym planned out – Capt would surely have her hands FULL this year! We would like to applaud great effort by our sisters in Singapore, organising their very first Muslimah 5km Race. We are grateful to be given the opportunity to be apart of their noble effort and be one of their sponsors. The run will take place at the Marina Barrage, Singapore, on the 9th February 7am.